Fairmont High School blood donor and blood drive volunteer Ashlyn Coleman is pictured. DAYTON – Five area high school seniors can win $1,000 for college tuition in the Lead The Way Creative Scholarship completion, sponsored for the 15th year by Community Blood Center and Vectren, a CenterPoint Energy Company. The deadline to enter is April 20. For the 15th anniversary, CBC is introducing a new online application available at the CBC website, www.GivingBlood.org. Students now easily can submit information, upload their high school transcript and upload images or video of their work. Scholarship applicants are challenged to design a winning marketing campaign for a high school blood drive. They must craft an original theme or slogan; explain briefly why it would encourage students to donate and creatively express the theme using traditional marketing techniques, digital or social media campaigns, or through innovative, artistic methods. 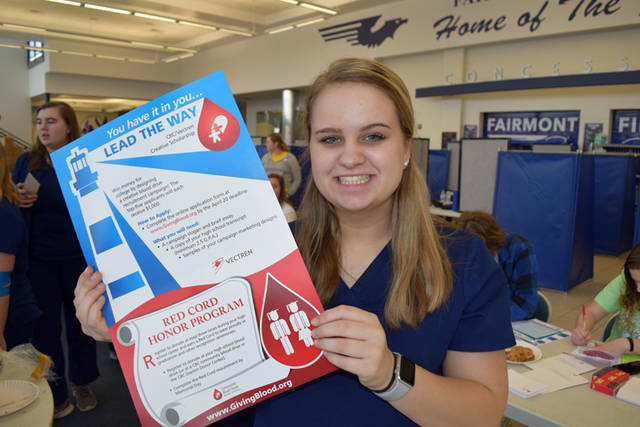 To be eligible for the scholarship students must be graduating, college-bound seniors whose high school hosts a blood drive in CBC’s 15 county service area of western Ohio and eastern Indiana. All applicants must submit online entries by April 20. They have the option to mail or deliver full-scale samples of their design work to: Community Blood Center/Attn: CBC Educator, 349 S. Main St., Dayton, OH 45402. Work samples must be postmarked or delivered by April 20. The online application form and examples of winning campaigns are available at www.GivingBlood.org. For more information, contact Cristina Pickle at BloodEducation@GivingBlood.org.